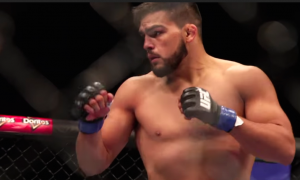 Leading up to UFC 234, Kelvin Gastelum has predicted he’ll take the middleweight title from Robert Whittaker by knocking him out, and recently the challenger described how he sees that happening. Gastelum will face Whittaker in the headliner of today’s card, which is taking place in Melbourne, Australia. In a recent interview posted at UFC.com, the hard-hitting fighter had this to say, while discussing how he envisions the fight going. Gastelum (15-3) is coming off a split decision win over “Jacare” Souza in May, 2018. Whittaker (20-4), on the other hand, earned a split decision win over Yoel Romero in his outing, which took place in June.